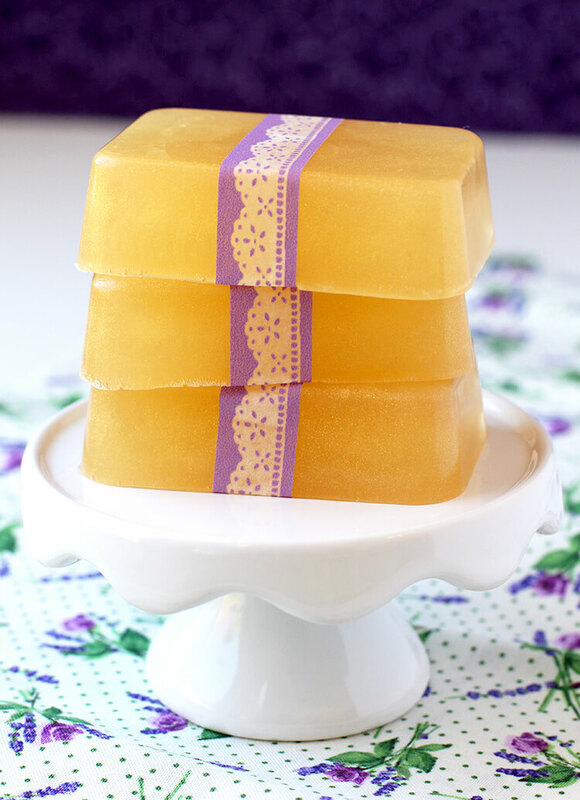 This Honey Lavender Soap smells incredible, and you can whip up a batch in just a few minutes! Makes a great quick and easy DIY homemade holiday gift idea that’s perfect for friends, family, neighbors, and teachers! 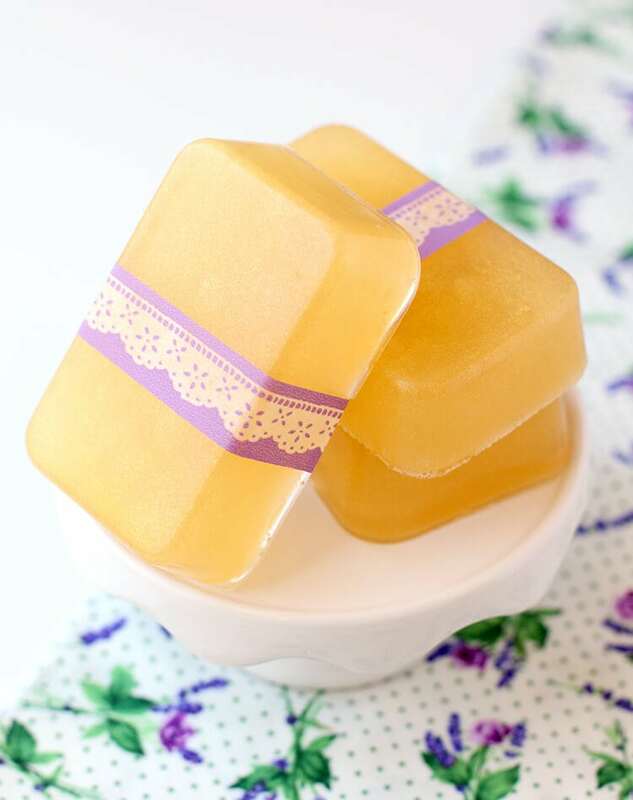 I love these honey lavender soaps for their sweet delicate aroma and for the awesome skin benefits (did you know that lavender and honey are both fantastic for your skin? ), but what I love even more is the fact that I can whip up an entire batch of these beauties in under 10 minutes! They take a little bit longer to firm up, but the actual “work” part is done in less than 10 minutes – can’t beat that! When the soap base is completely melted, add in the gold soap colorant (about 1/3 of a cube) and lavender essential oil (about 10-15 drops). Stir until the colorant is melted and well mixed, and pour into the silicone soap mold. 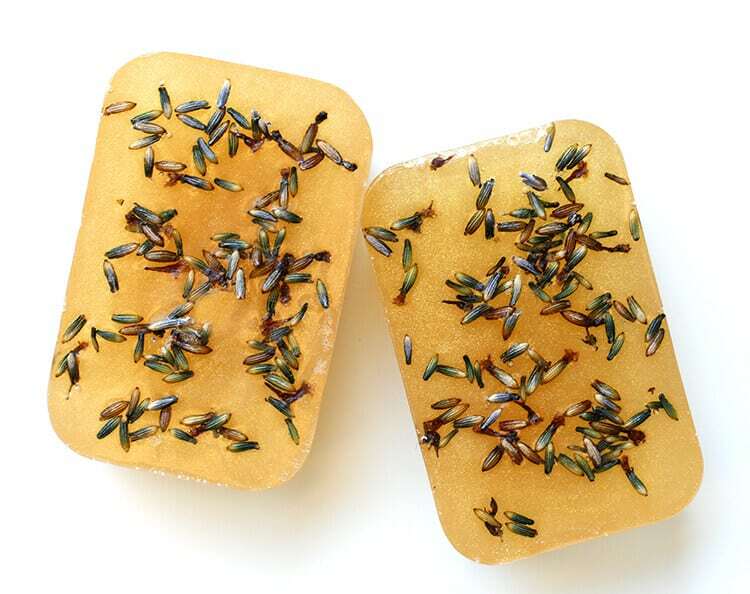 If desired, sprinkle the tops of the melted soap with lavender buds (note: buds may discolor slightly). Allow the soap molds to sit undisturbed until completely cool (about 30-90 minutes depending on temperature/humidity). 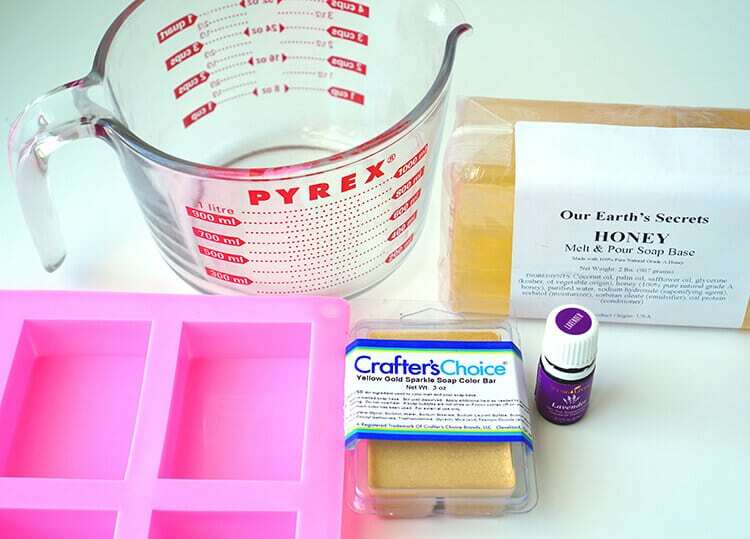 When the soaps are cool and firm, carefully remove them from the silicone mold. 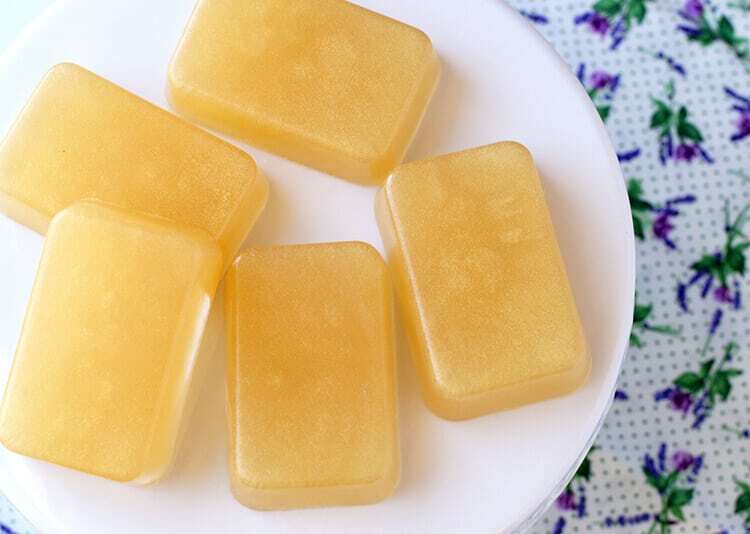 I love the way that the gold colorant adds a TON of shimmer and sparkle to the finished soaps! 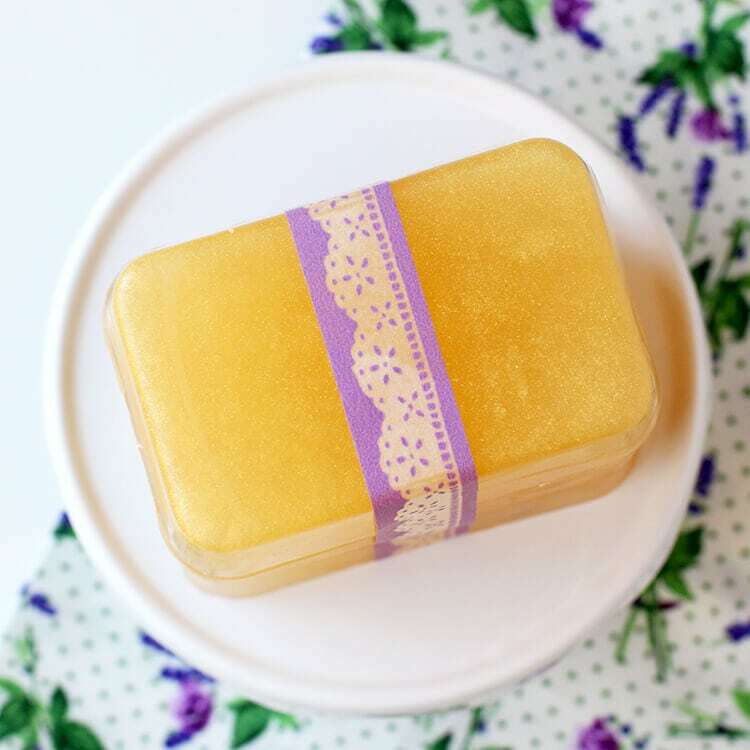 Wrap the soaps with pretty washi tape, baker’s twine, or ribbon for an easy and inexpensive DIY gift idea! 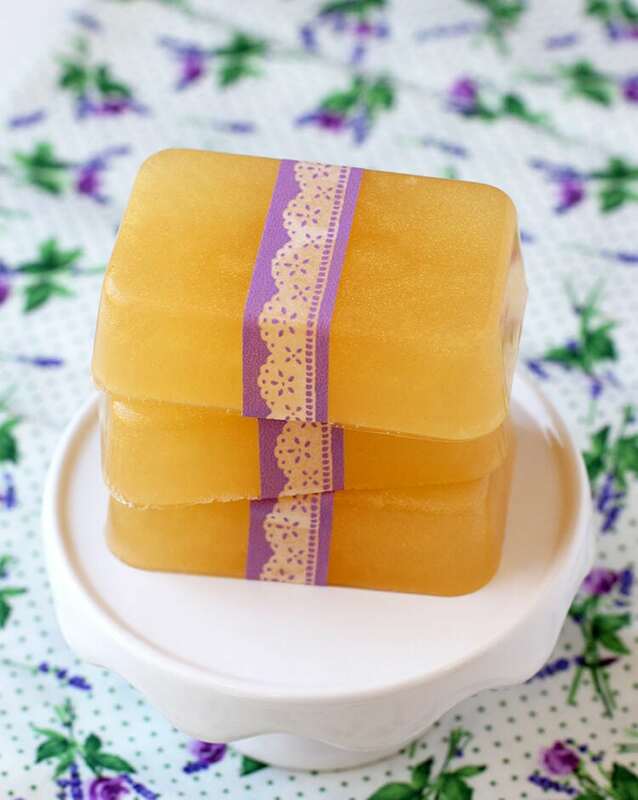 The fragrance combination of lavender and honey smells incredible, and the aroma is soothing and relaxing. Perfect for a hot bath at the end of a long day! I haven’t tried this combination before, cant wait to smell it. When can your soaps be used? What’s the timeframe for them to cure? Thank you. 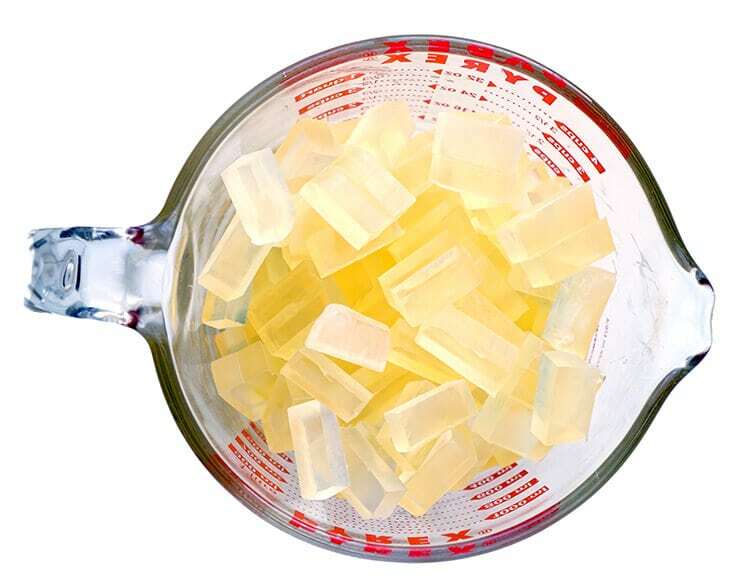 Melt and pour soaps such as these do not require a curing time. They can be used immediately after they have set and firmed (around 30-120 minutes depending on temperature and humidity). Thanks so much! Any tips on packaging the soap? I’ve heard glycerine can sweat. Saw your soap recipe awhile back, ordered all supplies from Amazon, I even have lavender which I grew, so am going to give it try this weekend. Very anxious. Thank you so much for sharing.